Rashid Jogee was born in Bulawayo, Zimbabwe where he currently lives and works. His family, who had immigrated from India, built one of the first mosques in Zimbabwe, establishing a point of reference for the Islam religion in the country. 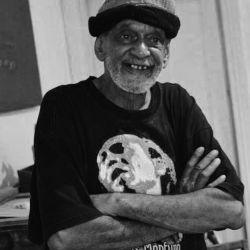 At nineteen Jogee began painting and later studied Applied Arts and Design at the Polytechnic College in Bulawayo. In 1971 he started teaching at the Mzilikazi Arts and Craft Centre. During the Second Chimurenga War, which brought about Independence, Jogee was conscripted and served as a medic for the Rhodesian Defence Force (RDF). 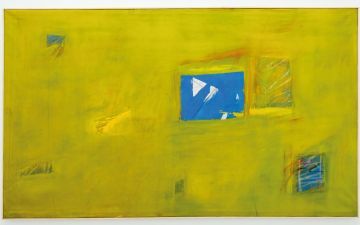 Describing this period of his life as emotionally destructive, Jogee’s abstract paintings were produced through a meditative style of painting that he was first introduced to by Marshall Baron and Steven Williams, namely ‘action painting’ — the ability to exhaust the body (hatha) and the mind (raja) in order to achieve a subconscious balance between the two. Jogee has had over forty-eight exhibitions in Zimbabwe, as well as exhibitions in South Africa, Botswana, Mozambique, England, USA, Denmark, and Sweden. 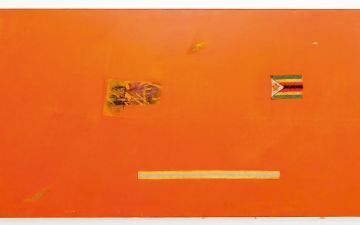 In 2013 he represented Zimbabwe at the Venice Biennale and in the mid-1990s, was honoured by the former President of Zimbabwe, Mr R.G. Mugabe with the Presidential Award of Excellence for his contribution and outstanding dedication to the development of the visual arts in Zimbabwe. Rashid Jogee’s works are featured in the Zeitz MOCAA exhibition, Five Bhobh – Painting at the End of an Era (2018 – 2019).